Reading a friend’s post today made me want to broach the topic of kombucha. Don’t worry. We’ll uncover the mysteries of this miracle drink. I think it best not to rehash information that most bloggers have either touched on or gone in-depth on previously. Instead, I’m going to make this a linky link post as a reference point for everyone who could use a little more info about this amazing fermented tea. What is kombucha and how do you pronounce it? Kombucha is essentially sweet tea fermented with a SCOBY. A SCOBY is a Symbiotic Culture of Bacteria and Yeasts that has been handed down and shared through the generations. 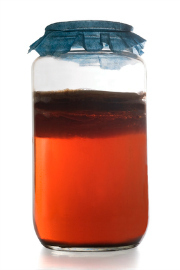 It is thought that the SCOBYs we use today are all related and descended from one brewed over 2,000 years ago. It is a Japanese word, and the basic pronunciation is kahm-BOOCH-ah (which is why you’ll hear people calling it ‘booch’). Jenny at Nourished Kitchen has a wonderfully thorough post on kombucha basics. Kristen at Food Renegade digs deep to share the health benefits. And Patty at Loving Our Guts provided the inspiration that led to the post you are currently reading. Using it as an acute remedy for her family’s ills made me hightail it into the kitchen and pour a drink for Katie and myself. My four year old knows the good stuff! We’re both feeling unwell from veering too far off our diet lately or a weird bug that has descended on my house, and I completely forgot about adding booch to our healing routine. I also use it for an energy boost and to obliterate sugar cravings. Want to brew it yourself? There are 3 ways to do it. Buy a SCOBY (see sources – affiliate link). Ask someone who already brews their own kombucha for a SCOBY. You may find somebody local who is happy to part with a SCOBY baby – they multiply every time you brew – or someone willing to send you one for the cost of shipping. Make one yourself! Fun, frugal, and funky in a good way. Now that you have your SCOBY, it’s time to brew! Amy at Real Food Whole Health has a great video on how to make a batch of kombucha. Though it’s commonly brewed in a wide bowl, I use a 1/2 gallon mason jar. I keep it covered with an unbleached coffee filter secured by a rubber band to keep out possible bugs and ick floating in the air and then wrap a towel around it to keep it dark. I love the thick rubber bands that come on certain grocery store veggies like broccoli for my ferments. If you are ready to go whole hog and want to learn everything you can about kombucha, hit up Google for more information that you could ever hope to keep in your head. Do you have any kombucha resources that you feel are essential (your own or otherwise)? Cultures for health has a free kombucha e-book that I really liked. Thanks for sharing about my post. Thanks Patty! I will check it out. I find that I have to follow their water kefir instructions to the letter or my grains get contaminated. It will be great to read their tips on brewing kombucha. It’s funny to see multiple postings today about kombucha…I just got my first batch done today! As a newbie to booch and kefir, I have a question. Is it possible to drink too much? Very exciting! I am in love with kombucha. You can definitely drink too much. Both can cause significant detox and healing reactions, so I would start very slowly with 1 teaspoon per day and then move up every 3-4 days if you don’t notice any reactions. It will give your liver time to clear any toxins and keep you from getting ill from toxin overload. Both are also some of the best gut cleansers we have access to in the food world, so they are definitely worth sticking with when people aren’t suffering from histamine overload and allergies to those foods.